Bedlam's Eric Tucker re-imagines J.M. Barrie's classic 1904 play about a boy who won't grow up. A cast of six inhabit Barrie's 25 characters including Pirates, the Lost Boys, Mermaids and the maniacal Captain Hook. Recommended for ages 14+, but may be suitable for mature audiences, 12+. Contains adult situations. Groups of 10 or more can purchase $49 tickets. Email info@bedlam.org for more information. 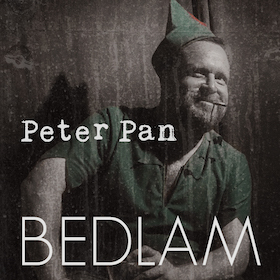 Bedlam is a NYC-based not-for-profit theatre company under Artistic Director, Eric Tucker and Managing Director, Kimberly Pau Boston. Founded in 2012, Bedlam received instant recognition for its production of George Bernard Shaw's Saint Joan in which only four actors played over 25 characters. Additional past shows include Sense & Sensibility, The Seagull, Dead Dog Park, New York Animals, Hamlet and two productions of Twelfth Night that ran in rep with each other. Bedlam's productions have been noted as Ben Brantley's "Critics' Picks" for The New York Times six times, included on The New York Times "Top Ten Best Show Lists" two times, as well as those of The Wall Street Journal and Time Magazine respectively. The Wall Street Journal also named Eric Tucker as "Director of the Year" in 2014. Bedlam has won three Irne Awards, two Off Broadway Alliance Awards and an Obie Grant. Bedlam has also been nominated for two Lucille Lortel awards, a Drama League award, and five Elliot Norton awards, winning for Outstanding Visiting Production and Best Ensemble for Saint Joan and Outstanding Visiting Production for Twelfth Night / What You Will. Bedlam also offers a free Veteran Outreach program and adult education workshops in acting, producing and directing. For more information, please visit their website.